The holidays are all about spending time with the ones you love and giving to others. This time of year is very special for us because we get to give back to the community.One way we brought cheer to those in our community was being the title sponsor for Toy Truck 2015. We teamed up with Kix 106 and WMC Action News 5 to make this event happen. Toy Truck 2015 benefited Porter-Leath, a Memphis based non-profit organization that provides assistance to at-risk children and their families. Offices signed up to participate, and were given boxes for their donations. Every box was then dropped off at Bud Davis Cadillac on December 18. Participants were also able to drop off their items at WMC’s studios. Our goal was to give over 5,000 children who benefit from Porter-Leath’s services Christmas gifts. We’ve exceeded our goals! Thanks to your support, 5,874 of the preschoolers that Porter-Leath’s support had gifts this Christmas. Your generosity also allowed Porter-Leath to donate extra gifts to partner programs and pre-schools in the Memphis area. "These children would have received little or nothing without Toy Truck,” said Rob Hughes, Development Director at Porter-Leath. “This was a huge win for the community. Over $35,000 was raised and matched during the event, meaning over $70,000 in support for Porter-Leath's programs that empower over 12,000 local at-risk children and families to achieve a healthy, optimal and independent lifestyle each year. 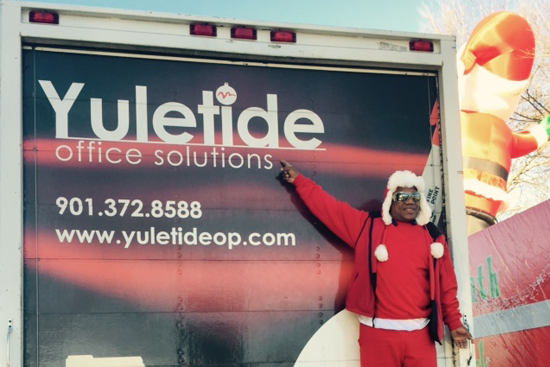 Porter-Leath is so very grateful for our friends at Yuletide for leading Santa's sleigh to each of our Preschoolers!" Thank you for once again for all of your support! Want to get more involved with Memphis area non-profits? Head over to our community page to view other organizations we work with.